Cost effective panel made from highly compressed wood fibres. Usually finished smooth on one side and textured on the reverse. 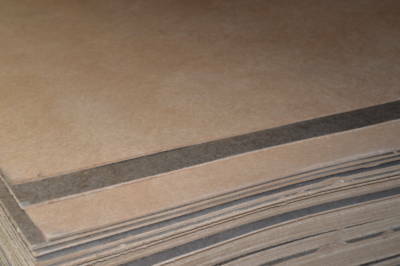 Hardboard is specifically designed and manufactured to be a low-value but versatile board. Cost of production is kept low by using the natural resin in the wood fibres to bond the board rather than synthetic adhesives. Other materials can be added during the production process depending on the desired usage. An example would be tempering the board with linseed oil to make it less susceptible to warping. Hanson Plywood sources the majority of its collection of Hardboard Panels from FSC® Certified forest concessions. The company’s robust Chain of Custody management system ensures that these certifications are respected and adhered to throughout the supply chain. For further information, please refer to our Environment Page. Please note: Under EN 622-2, ‘General Purpose’ refers to products suitable for ‘use in non load-bearing applications’. Hanson Plywood’s stocks of Hardboard are suitable for HB – General purpose boards for use in dry conditions.